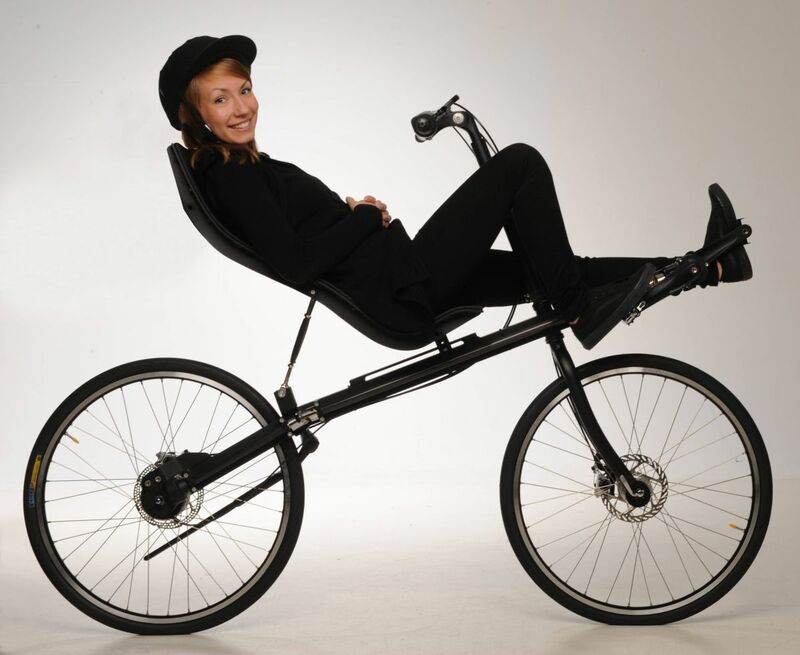 Timo Sairi is finnish designer who has developed and built a recumbent with shaft drive. Here under you can find his comments and few pictures of his bike. “First of all let me tell you a litlle of my background. I am an architect and a furniture designer and I have been working with industrially manufactured design furnitures. Thats why perhaps my interest is always on simplyfying and to clear any design task given. One year ago I got an invitation to participate on an exhibition dealing with ecological design, here in Finland. 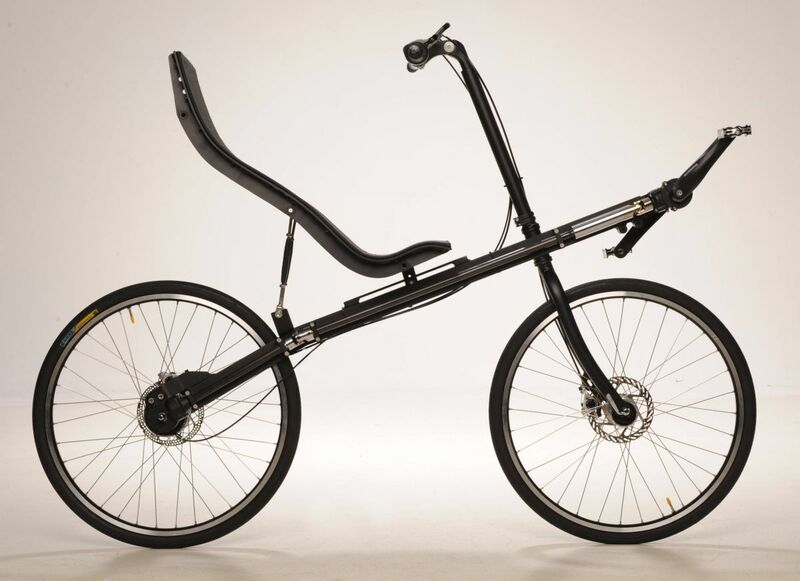 So I decided to build a recumbent bike since I believe bicycles are very ecological indeed. So I wanted to do something about this as a designer, just to make them look a little bit more familiar. To replace the front chain sprockets and to get rid of long chains sounded like an idea worth of thinking and for that goal a logical area to develop was a shaft drive. My shaft drive system is based on an excisting component that is made for a normal upright bike. Longer shaft with swivel joints and teleskopic adjustments was needed. – weight, that is about 1.5 kg more than a chain drive, most of it caused by a heavy hud gear unit. The bike is equipped with shimano disk brakes, shimano 8 speed alfine hub, pantour`s front suspension hub. The frame is aluminum and the shaft is carbon fibre. I havent yet calculated any exact prices for the bike but basically it has less parts than a normal chain drive. The next step would be a foldable version since the system has quite a natural potentials for that, additional equipment like bags and mud guards and an invisible rear frame suspension (inside the frame) are under deveploment. I’m very excited to see where this is going to go. A great looking concept. Are any of the drive-train parts made from composites? If I know correctly, the long tubes which are part of the shaft drive are made of carbon. Beautiful! I want one! Please consider under-seat steering for this design. It would add a little mechanical complication, but I think it would work well with this design. I had this idea to generate energy soley by the rotating motion of the driveshaft. Since the shaft if so long lots of high density batteries could be stored inside this shaft or something. I am not technical. And maybe some clever aerodynamic shape (seen from side view) due to side wind. For instance the shape of a wells turbine. Or the wheelsoccet shapes from the cars of the world solar chalenge in Australia. Like the Nuna 1, Nuna2, Nuna3 etc. 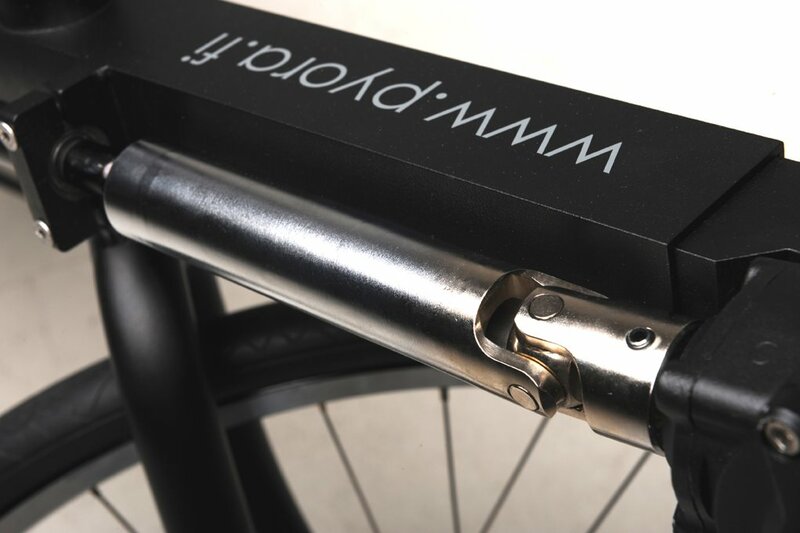 For the seat I would refer to The Greenmachine from the dutch recumbent builder Flevobike. They started with the same shape seat as you had but altered the bottom end of the seat in a triangular shape. For stepping up and off the bike and also the seat will not create extra friction for the hamstrings (upperlegs) while peddeling. I thing you made an awesome design. I have a flevo racer(frontwheel propelled), a recumbent with understeer. Which has to benefits: 1. aerodynamics, the shape of the cyclist is I think more aerodynamic; 2. the back of the cyclist is flatter because the shoulders hang lower then the arm are in a low position by an understeer. This makes a more stable sit and is thereby an improvement for the balance. This shaft system runs smoothly? The cardan-shaft’s spiders (both) is only transforming rotation linearly if both spiders have the same angle. Maybe it not seen properly on the pics. Otherwise, I really would like to ride this bike! As a person who continuously studies the advance of cycling design, this is a very impressive solution. I have a rear drive recumbent and feel that the long chain makes noise, adds weight, loses efficiency, and is complicated mechanically. An alternate solution is a front wheel drive configuration but this complicates steering. The shaft drive system combined with an internal hub transmission overcomes the long distance power transfer in a very elegant configuration. Unfortunately, these components add cost and weight. 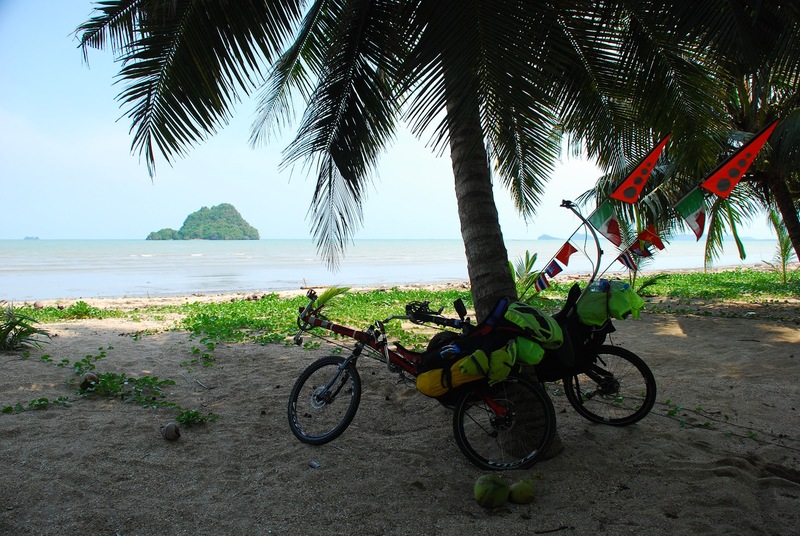 Recumbents are about aerodynamics and rollability. It’s about running fast downhill and using that kinetic energy to move uphill. Because of the rider’s position, power transfer isn’t as effective as uprights. So I would focus on reduction of friction, improving aerodynamics, and incorporating better methods of transferring power. That being said, I want one. How soon can you ship it? From the biomechanic point of view the position on recumbent is much better for power transfer than the upright bike. This is mostyl because you canpress your back into the seat and use all the power you have. This is also the reason why recumbents are faster than uprights. It is not only a question of the aerodynamics. I was just thinking about the posibilities for a velomobile. A trike with electric motor and a body to protect you against the rain and wind. The higher positioning that you have looks verry interesting to me. This type of bikes are already expensive therfore it wouldn’t be such a big problem to have a higher price. I would in fact be verry interested to buy one.